So you've sent a promo pack to a promoter to pique their interest in booking your artist, and now the promoter wants some details. Create an offer sheet so you can confirm the gig. 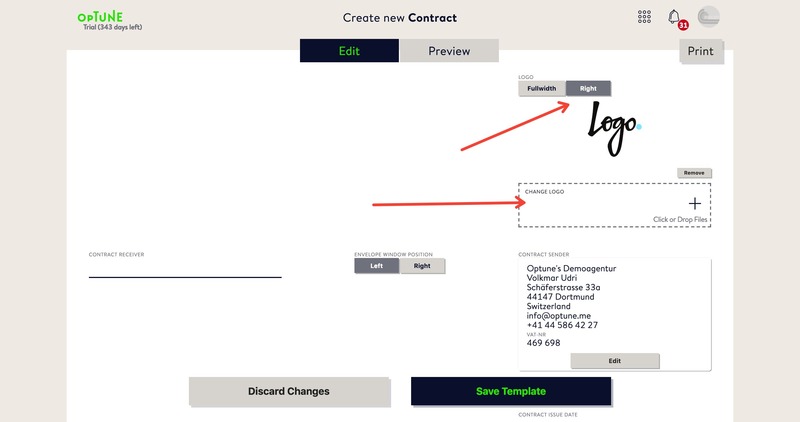 Starting from your Dashboard, go to your drop-down menu and select CONTRACTS & OFFERS. 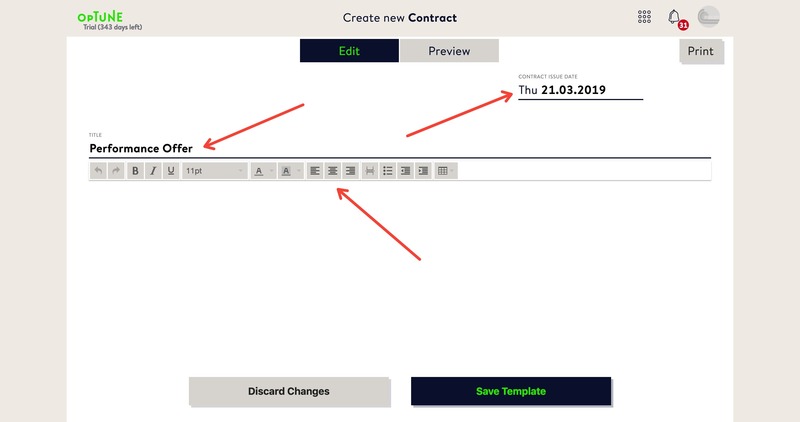 This brings you to the Contracts & Offers overview where you can see the contracts and offers that are Open and those which are Done, or passed their completion date. In this case, we want to create a new offer, so we'll select the Templates button at the right of the page. 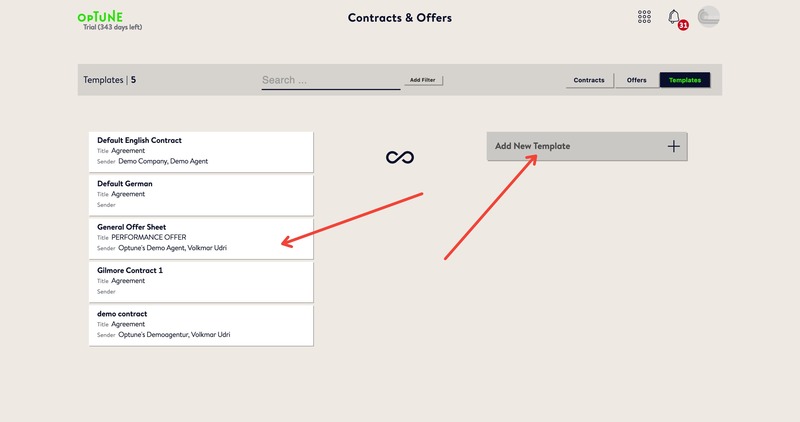 Your existing templates for both contracts and offers are displayed on the right of the page. It's important to include the word "offer" in your template name so that you can easily differentiate between the two types when you're searching for either one. Optune includes a pre-made offer template called General Offer Sheet. You can use this template to create new offer sheets for your artists, but for the purpose of this tutorial, we'll create a new template from scratch. Click on Add New Template at the right of the page. Firstly, add a name for your template in the field on the left. It's best to include the word Offer in the title. To the right, there is a PLACEHOLDER VALUE field. This is where you can enter words or characters that will appear in place of hashtags that are not yet connected to information in the Booking Overview. The default value is t.b.d or to be defined. The Optune hashtag system is explained in detail here. You can choose if you want your logo to appear centred or to the side of your form, and you can upload a new one should you wish. On the left of the page is the contact information for the CONTRACT RECEIVER (or Offer receiver). You can search in your contact database for existing contacts, and their information will automatically be filled in to the fields should you select one of them. In this case, we're creating a general offer sheet, so we'll leave out the specific contact information for now. In order to save your offer template while you're creating it, you must go to the bottom of the page and click Save Template. 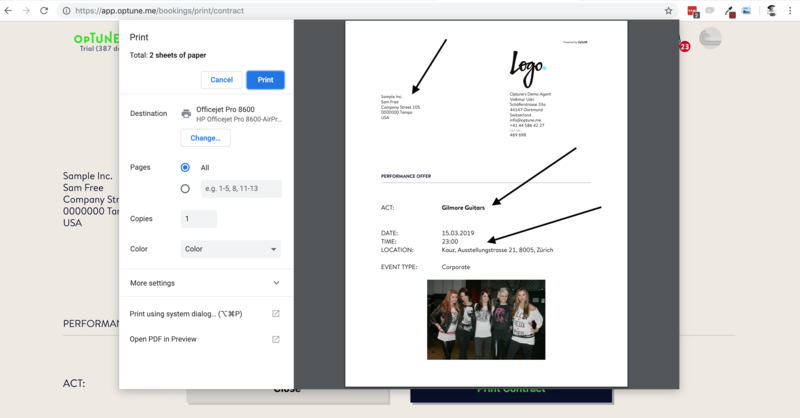 On the right of the page is the CONTRACT SENDER (or Offer sender) contact information - your agency information that appears automatically based on what you entered into your Optune account. You can also edit this information here. In the centre of the page are the Left and Right buttons for the ENVELOPE WINDOW POSITION. 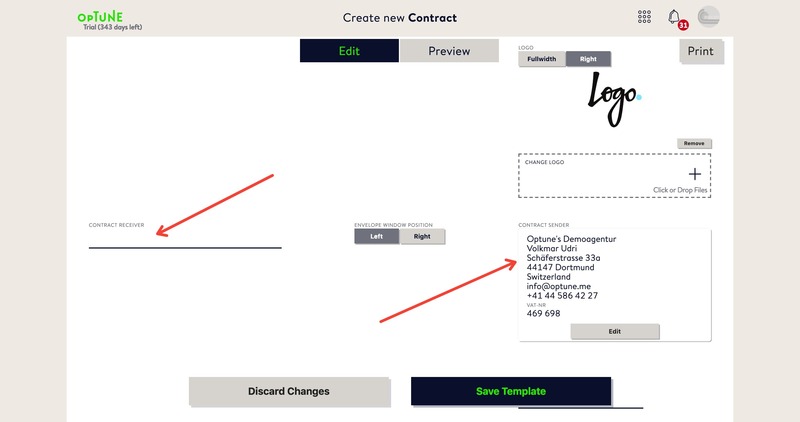 These buttons simply allow you to switch the CONTRACT RECEIVER and CONTRACT SENDER information from one side to the other depending on which format you prefer. Moving down the page, be sure to add an ISSUE DATE for your offer, and give the form a title. Also take note of the toolbar at the top of the document creator. This is handy for adjusting the appearance of your offer by including bold text, bullet points and tables for organizing your content. It's time to add content to your offer. The format you choose is entirely up to you. You might want to use bullet points to mention specific talents or achievements, and add a table to achieve a neat and tidy look. Optune provides you with a Hashtag library. The hashtags are meant to be copy-pasted, and then they're replaced by the corresponding information from your booking. For example, if you use #artistName in your template, then apply that template to a booking, the name of the artist will appear in place of the hashtag. This way, your template is transferrable to different bookings. Please see the hashtag FAQ for further instructions. At any time while you're creating your offer, you can see a clear overview of the information by clicking on Preview at the top of the page. To see how it looks in a printed or pdf format, click Print at the top right of the page. We recommend doing this especially just before you're ready to finish. When your template looks the way you want it to, simply close the print preview and click the Save Template button at the bottom of the page. You can see that the new template is now listed in your Templates folder. Let's apply an offer template to an actual booking. The only difference between Offer templates and Contract templates is that offers do not include a signature line at the bottom of the document. Otherwise, the functions of the two templates are the same. 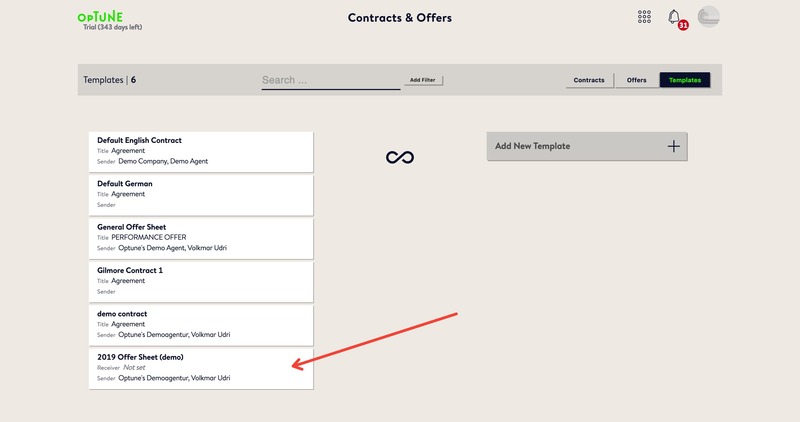 From the Contracts & Offers page, click on the Optune logo at the top left to return to your Dashboard. Then go into your Bookings Overview at the top of the page. Choose a booking, one that is Pending for which you would like to create an offer sheet, from your list or calendar. Make sure that you have already filled in - or that you now fill in - as much information as possible about the potential gig. Once in the booking, scroll down to the CONTRACTS & OFFERS card and select Create new Contract / Offer. Select Offer and then a template. This time, we'll choose the General Offer Sheet. 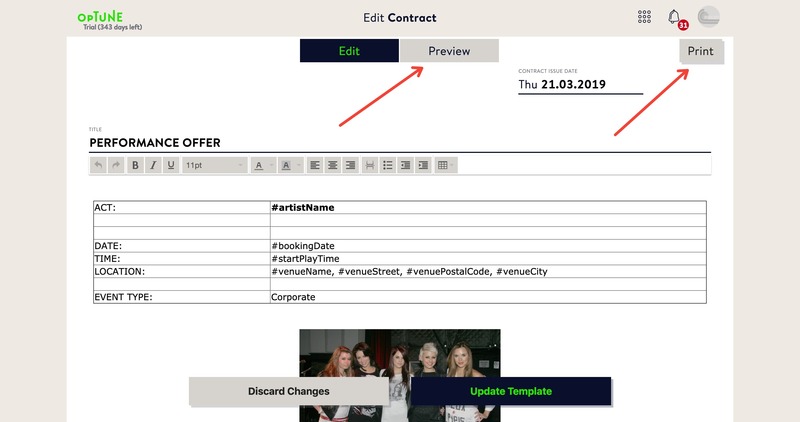 Now you'll want adjust the offer sheet to suit the needs of the particular artist and booking, which may include adding the receiver info, changing the photo, description, and any information that isn't going to be replaced by the hashtags. When you're ready to see how it looks, click on Preview or Print at the top of the page. You can see that the hashtags have been replaced with the information from the booking. Now your offer is ready to be printed and shared with the promoter. If you wish to make more changes, cancel the print and return to the offer. You can make alterations as you wish, and then either preview it again or click on Save Offer at the bottom of the page to save it. Good luck!